Busy Bee Finger Puppets. Keep kids buzzzzy with these bumblebee finger puppets. 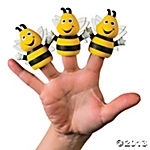 Fun for playtime, story time or party time, these Busy Bee Finger Puppets will quickly "bee" a favorite! Vinyl. 2 1/4"